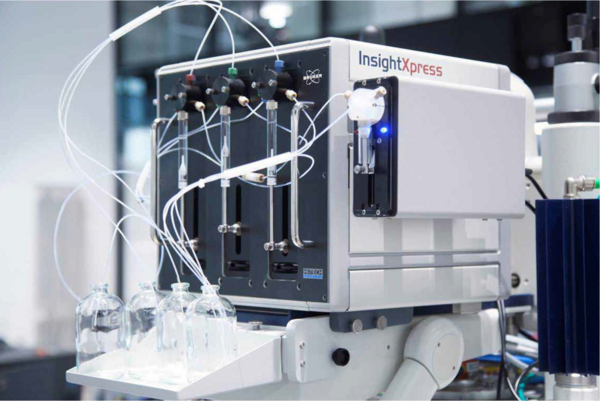 InsightXpress combines the rapid reaction monitoring of stopped-flow measurements and the analytical power of NMR detection. In partnership with Professor Guy Lloyd-Jones at the University of Edinburgh and Bruker, TgK Scientific have developed a system that brings rapid mixing directly to the NMR probe. With a dead time of less than 150 ms, InsightXpress reveals detailed kinetic information for reactions with half-lives of a half a second or lower. InsightXpress is sold and distributed by Bruker. Please visit the Bruker website for more information and to arrange sales.